A Formal Meeting Request Letter Sample has the vital importance in every business fields and many partnerships. These are conducted by various norms and people get together to join them for a plan. You can make a meeting based on any criteria a meeting appointment letter is written by an individual or an institution to make the purpose of meeting like canceling or arranging. Here we will know about how to write a sample letter for meeting schedule. 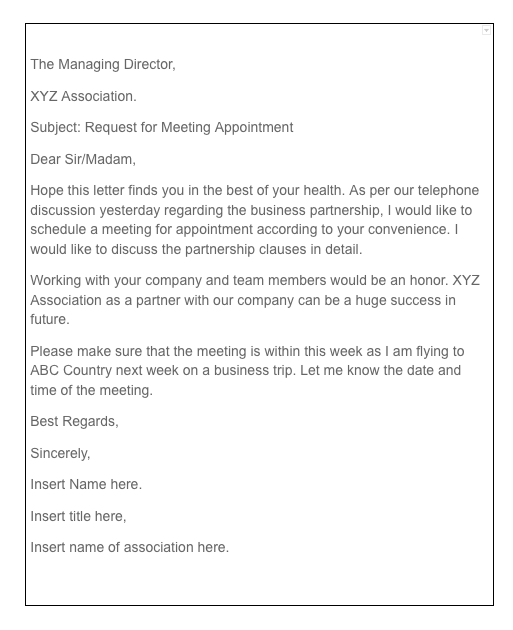 The letter puts more emphasizes on the meeting rather than emails or texts. Your connections are the valuable source of any conversation and one needs to be in it. This makes a person professional in their work and skills. Even for a successful person talking with someone will help in developing skills. YOUR INTRODUCTION: first of all, it is the most important thing to do is to introduce yourself where you can write about yourself and your work. If you were friends or colleagues then you don’t need any long introductions otherwise you need to know where you met or how you can to know about that person. EXPLAIN YOUR SKILLS AND EXPERIENCES: you can share your skills and experiences in your company or industry. That person needs to know that how much your work is important to you and how much serious you are in it. your skills should elaborate about yourself and describe your experiences as a person and employee that how effective you are in your work. EXPLAIN WHAT YOU ARE EXPECTING: make the elaborated discussion that what you are expecting and what you talk about. How you want an influence in your industry and any questions you are having about that person’s company. MAKE IT PROFESSIONAL: make your letter professional by various means. It should be written briefly and as required yet informative. Make your letter precise and concise. It should be accurate without any spelling or grammatical mistake. Your letter should carry all descriptions orderly and in format to make it look professional. Your letter should be professional and impressive in your way you are writing it. so the first impression is writing your letter in a proper formal format. Start it by writing a current date on the top on a left-hand sign. Then after space, write the receiver’s name and complete address and then give salutation like (Dear Mr. Lee…). Then start writing the main body of the letter in which you can write a genuine request about a meeting. Then, in the end, you can write sincerely, obediently or directly yours and ‘your name’. 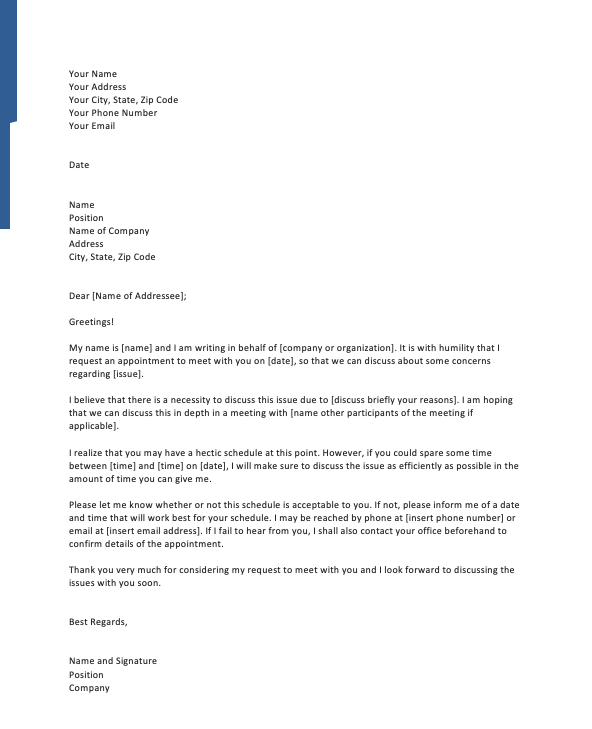 Thus we can say that the request letters for formal meetings with the business partners. You can write it in many ways. For this, you can download samples and examples, and get an idea about the pattern of writing the request letters. Request letters are the first contact that you make with a person so have it wise.